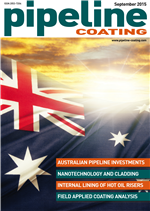 The September 2015 edition of Pipeline Coating is now available for viewing. Just click here to see the magazine in full, completely free of charge. Global industry news including latest results from Shawcor, Aegion and Wah Seoung and new contract wins for Technip and IEnova. Plus, planned pipeline investment by Gazprom, Kinder Morgan and MarkWest Energy. New product introductions for the pipe coating industry including heating hardware, improved management software solutions, coating testing equipment and pipe plugs.